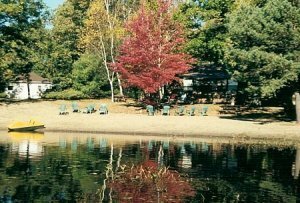 Bala-Hy Motel and Cottages is situated in the quiet, picturesque town of Bala. Family owned and operated for the last 66 years, we pride ourselves in providing friendly service, clean accommodation and a superb, private sandy beach and island. The Bala-Hy consists of 7 rooms of various sizes that include air condidtioning, satellite television and free internet. At Bala-Hy we pride ourselves in providing a unique and relaxing experience. Whether it be the picturesque view over a sandy beach, or a secluded walk over a foot bridge to your own private island we know your stay will be one to remember. The entire town of Bala is within a 10 minute walk. You can enjoy sitting beside the famous Bala falls, shopping the numerous clothing and antique stores or enjoy a round of golf at any of Muskoka’s courses. With 7+ acres and 875 feet of prime waterfront on Long Lake there is plenty of room to explore a variety of original Muskoka settings. You can walk across your wooden bridge to enjoy your private island, relax and swim at your beach or build a bonfire on the Pre-Cambrian Shield rocks. No matter whether you are staying in our motel or in one of our cozy cottages, the Bala-Hy family is at your service to ensure that your stay is enjoyable, comfortable and most importantly relaxing.